Something that ‘outsiders’ probably don’t realise about Fullmetal Alchemist is just how grotesque and disturbing it can be for mainstream shonen; it has never been a story that shys away from death, even when the victims are cute little girls and their pet dogs! This lurched back into focus during episode 20 of Brotherhood, when Ed, in-between bouts of throwing up, exhumes the remains of what was supposed to be his half-transmuted mother. While the act of digging up a long-buried grave is, in itself, a stomach-turning thing to do, after Ed looks at the remains, a plot twist even more disturbing is revealed, that the body they pulled back from ‘the other side’ wasn’t their mother’s at all! Who’s body was it? And why did it appear in place of his mother’s? 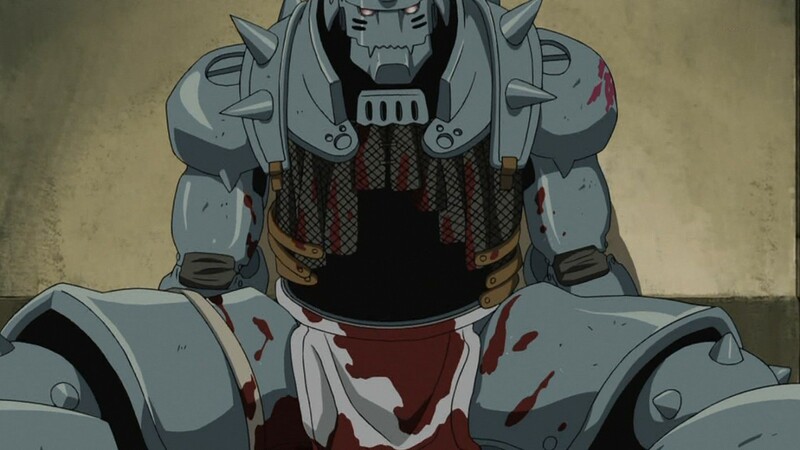 The story continues to raise these dark questions, and with no comforting, morally-sound answer in sight, I really think that FMA is overlooked as horror. Scenes like these, as well as the twisted fate of characters like Martel, are as cruel and disturbing as anything I’ve seen in anime. Oh god do I agree! I remember from the first series when Rose was shown the immitation of her brother and it was some gruesome transmuted bird thing. That still remains one of the most horrifying things I’ve ever seen in an anime. But I think episode 20 was not very clear. I see a lot of people confused. Although the thing that Ed & Al created was not their mother it is not anyone or anything else either. It was just a human body that they created with raw materials. It was never alive. The reason it moved was because Al’s soul was in the body for a time. This is important because from this Ed discovers that it is impossible to bring back the dead but it is possible to get Al’s body back. Three posts on FMA I am impressed. Too bad I probably can’t get you to read the manga. I’d totally forgotten about that scene, but now that you mention it… URGH. 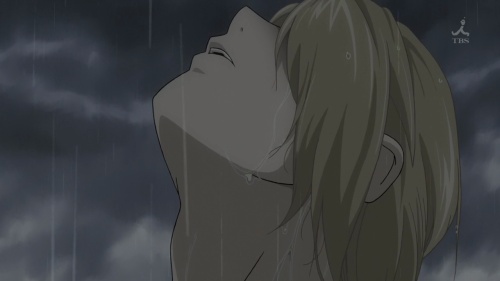 FMA seems to have a particular brand of body horror I find quite… skin crawling. Earlier in August I resolved to start posting more, even if said posts are fairly short/cover the same anime. Many of my favourite blogs of the past are those that blog to a consistent schedule and I’m trying my hardest to do just that now. Anyway, when I say ‘Who’s body was it?’ I’m more just thinking about what the thing may have ended up looking like? For example, it had black hair (may be that’s where the Homunculus come from? )– the features of the body had to come from somewhere? Also, really cool that Arakawa is into her horror films, must admit I was getting some big ‘Hammer Horror’ vibes from Ed’s role in this episode , FMA can be so pulpy and gross, which I love! 🙂 Have you got a link to an interview or anything I can read about her? One day I may read the manga, but I’m enjoying the suspense of following the anime at the moment and wondering where this might all lead! Aggghh, reading these posts and trying to swallow all my spoileriffic comments is killing me. I am very glad you’re back to more regular posting, though! I do have the second (third?) the recommendation to read the manga, though. As much as I’m enjoying the re-do of the anime series, the FMA manga is just such a work of art. Maybe I’m overly biased because it’s one of the first manga I read in Japanese, but it really is brilliantly drawn and has very thoughtfully written dialogue. Oh, no worries, you’re English is perfectly readable. It’s also cool that you’re probably going to go ahead and read the manga. I guess I’m enjoying the anime too much to ‘spoil’ any future episodes (e.g. reading Ed’s dialogue without Romi Paku would be just plain wrong for me), but sometimes it’s better to read the source material instead. I remember watching one episode of the Gantz anime and then binging on the manga instead. I guess I’m content enough to get FMA in weekly doses for now! Thanks, 0rion, and the same goes for you, too. Although I’m rubbish at commenting on other people’s blogs, I do read/lurk on Epic Win. And another vote for the manga, too?! Maybe I’m starting to think I should be reading it, and come to think of it, I suppose I could read it along with the anime, which could provide me with a nice balanced view of both without spoiling future twists and turns!